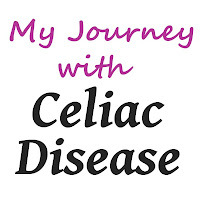 GF Ontario Blog: My Journey with Celiac Disease! 6 Year Anniversary! My Journey with Celiac Disease! 6 Year Anniversary! It's my Celiac anniversary - I've been gluten-free for 6 years! Ever wonder how I got here? How Gluten-Free Ontario was started? I was in my first year of college (Police Foundations, if anyone's interested) and living life to the fullest. Partying, going to school, studying, working. Looking back, I'm surprised I found time to sleep. I had multiple doctor appointments each week and numerous prescriptions and tests. After all of the tests I had been through leading up to that day, I was confused what she was calling me in so urgently for. Usually the receptionist calls and tells me to make an appointment some time in the next couple weeks. She wanted me there that day... that can't be good. She sat me down and told me I have Celiac Disease and needed to follow a gluten-free diet for life. I left the doctor's office, with half of me thinking, ha, there's a name to what's wrong with me and all those people who thought I was lying to get out of school and work can shove it! The other half of me was thinking, aw crap, now what? What am I supposed to eat? I went to Loblaws on the way home from my doctor's office for some much needed gluten-free food. (Having worked at no frills for 3 years, I knew they had no special food for me.) To my surprise, Loblaws had a pretty good selection! Remember, this was 6 years ago and I had never heard of gluten-free food or Celiac Disease until a couple weeks before my diagnosis. My first gluten-free meal that evening was potato pasta which I paired with some tomato sauce. Wow, that meal was an utter failure. The pasta was nothing like wheat pasta, it was quite disgusting and mushy and tasted gross. I thought I was doomed to a life of crappy foods. Little did I know, there was tons of companies out there who actually care about the quality of their food. Some you can't even tell are gluten-free!! Plus, you can make lots of yummy foods with simple ingredients. I was tired of all the American websites and support groups discussing restaurants and products that we don't have in Canada. About a year after diagnosis, I started a group on Facebook called Ontario Celiacs. It was a place for me and others to share local gluten-free information, like what kinds of products were out there, what stores had a good selection and restaurants that offered a gluten-free menu. I was all about trying to keep my life as normal as possible. Normal to me was having the ability to go to restaurants with friends and family and continue enjoying pizza and pasta, even if it was gluten-free style. This meant being aware of which restaurants could cater to my needs. I spent hours seeking out restaurants with gluten-free options and gluten-free menus. In my conversations with other Celiacs online, I realized that not everyone was familiar with the discoveries I had made about which restaurants offered food for us... and an idea came to me. I would toss together a quick list of restaurants in Toronto that had gluten-free food. But why stop there? What about all of Ontario?! Gluten-Free Ontario was born on July 31, 2007. (Well, that's when I bought the domain... the rough draft of the website was up a bit before then.) I had no idea how much it would grow in the following years. In 2010, I made a Facebook Fan Page for Gluten-Free Ontario just out of boredom one day and I actually got a few fans. In early 2011, I started posting random pictures of food I was eating, products I was buying and the page started growing. People were interested. I started updating the Facebook Fan Page daily and paying for some advertising. And here we are, 4200+ fans later and going strong. UPDATE: As of September, there are over 6700 fans. One thing that surprises me is how much awareness has increased, even in just the 6 years that I have been diagnosed. I see articles, television segments and big companies coming out with gluten-free food, not to mention the HUGE number of restaurants catching on, as well. What do I want to be when I "grow up?" I haven't quite figured that out yet... but you betcha, it's gonna be something related to Celiac Disease. I want to thank all of you for being amazing and supportive of my journey with Celiac Disease. This story turned out much longer than I intended... sorry about that. Do you have any stories about your gluten-free journey you'd like to share? Thanks for sharing! I'm like you .. not actually telling me I was faking but the questions about fine one minute, sick the next. It was a relief to finally know "it's not just me! it's real :) "
I've found your facebook group VERY helpful .. thanks for all you've done! Wow what a story. I have been gf for 2 years now and still learning the process. It was the best thing I ever did for myself. I suffered 40 years before diagnosis. I was sick all the time. People called me a whiner, faker, lazy etc too. Everyone thought I faked my bathroom trips too to get out of things. Of course that wasnt true. Now I dont have that problem unless I get accidently glutened. Now my mission has been to educate my family and encourage them to adopt this diet and start feeling better.